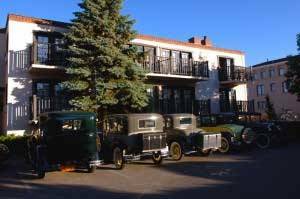 Though the Inn of the Governors sits in the thick of all things downtown Santa Fe, you may find yourself needing a vehicle-perhaps to enjoy the world-class Santa Fe Opera, or to enjoy some of the areas fabulous day-trips. The Inn prides itself in making the cost of your visit as affordable as possible. Just like our Mountain Sunrise Breakfast and Daily Tea & Sherry Hour, the parking is free. With 87 exterior parking spots and nighttime security, our parking lot provides a cozy way to rest your car while you jaunt about Santa Fe. Our parking lot can accommodate those vehicle that are 8' or less in height and without an accompanying trailer. We are unable to accommodate any oversize vehicles. Planning on leaving the car at home? There are multiple ways to get to Santa Fe from the Albuquerque Sunport. The New Mexico Railrunner (the state’s commuter train) runs from Albuquerque every day. Please visit the website at www.nmrailrunner.com to view its schedule. Please take a moment to review the “All Bus Connection” link to fully coordinate your transportation from the Sunport to the train depot. The Santa Fe downtown depot is a short six block walk from the hotel. Sandia Shuttle provides a direct van-ride from both the Albuquerque Sunport and Santa Fe’s airport to downtown Santa Fe and back. Please visit their website at www.sandiashuttle.com for fare and schedule details. If you are unable make a reservation with Sandia Shuttle, you may wish to visit www.roadrunnershuttleandcharter.com, as an alternative.